Fianna Fail TD Niall Collins and Independent Senator Frances Black are coming to the Great National South Court Hotel, Limerick on Monday 19th November at 8.00pm to speak about their recent visits to Palestine, the people they met, and the concrete steps Ireland can take against the ongoing injustice – including Sen. Black’s Occupied Territories Bill 2018. PLEASE JOIN, SHARE AND INVITE YOUR FRIENDS ON FACEBOOK, THANKS! The bill would end trade between Ireland & Israel’s illegal settlements, and passed a historic first vote in July. It soon returns to Seanad Éireann for the next stage. Senator Black will outline why she tabled the bill, how we can help to get it passed, and why Irish-Palestinian solidarity is needed now more than ever. 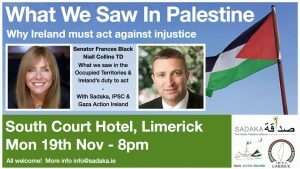 Hosted by Senator Frances Black, Sadaka – The Ireland Palestine Alliance, Ireland-Palestine Solidarity Campaign and Gaza Action Ireland.